Why undertake a DSE Assessment? Nothing is more important to a company’s operations than the good health of its staff. Especially in our increasingly automated world. In order to create the best possible working environment for office dwellers, both comfortable and engaging, a proper DSE assessment must be undertaken. What Equipment Does a DSE Assessment Cover? DSE stands for Display Screen Equipment, the assessment is aimed at protecting workers against common repetitive strain injuries. Put into place in 1992, the DSE assessment is part of official health and safety regulations. Some degree of competency when using display screen equipment is now required in more than 50% of job roles. Anyone using DSE’s for continuous periods of time (at least an hour) should be doing so in adherence to DSE assessment guidelines. Employees must be guided through and asked to undertake a DSE Assessment before starting a new job. The DSE Assessment ensures workers are safely operating their keyboards, desks, chair, telephones, smartphones, tablets, and monitors. It may seem ludicrous to believe people can harm themselves by simply having their keyboard wrongly positioned but the effects can be damaging to an employee’s health. The telephone or mouse must be positioned where the employee’s arm can rest without needing to be extended. For any tasks which require staff to regularly look at a physical document, an appropriate holder should be made available with enough desk space to position it at the same level as the viewing screen. Furniture also falls under DSE standard checks. 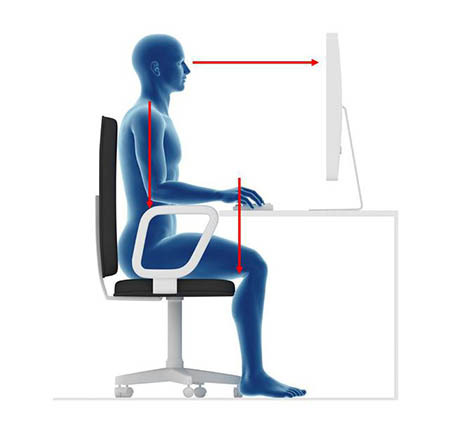 Workers should be able to sit in their chairs for long periods of time without discomfort. Chairs should be equipped with adjustable levers allowing the worker to adjust the height, back rest and tilt of the chair and any arm rests should not stop the worker from being able to pull their chair forward. If an employee is unable to rest their feet flatly on the floor, then a suitable footrest should be provided. Desks should be large enough to house the aforementioned equipment, with enough space so that they can all be used without interfering or colliding. Employees should not have to work around poorly designed workstations. DSE Assessments were introduced to help counter negative side effects attributed to operating a computer workstation. Common issues include backache, upper limb pains, aches and pains, repetitive strain, eye strain and fatigue. Inflammations caused by repetitive typing in an uncomfortable position can require medical treatment. The monitor screen brightness should also be dimmed in order to avoid any eye strain. It is also important to take short breaks looking away from the screen to give your eyes a rest. All of the aforementioned problems cause discomfort and can impact a company’s operations. They can all also be minimised or avoided by implementing DSE assessment quality standards. The route cause can sometimes be difficult to identify but it is important the DSE assessment criteria is practiced in order to create the safest possible working conditions. Every workstation should be designed with workers in mind and adhere to DSE assessment standards. Nobody enjoys going to work if they are suffering tremendous neck pains, no matter what the role is or how much money they may be earning. One of the most effective ways to ensure the ongoing promotion of good physical health amongst your workforce is to train a trainer so that you have an employee internally who is qualified to deliver workstation risk assessments. Click here to learn more about the benefits of our train the trainer courses. If you’re looking for a great Workstation Checklist for reference, we highly recommend this one, courtesy of Chairlines.com.